SAN LUIS OBISPO — Project Jupyter may be the best-kept secret on the Cal Poly campus, but the open-source software is well-known at such tech giants as Microsoft, Google and IBM, which have created entire commercial data science platforms based on it. Led by Cal Poly physics Professor Brian Granger and Fernando Pérez of UC Berkeley, the international team that developed Jupyter received the 2018 Software System Award from the Association of Computing Machinery (ACM), the world’s largest society of educational and academic computer scientists. Past award recipients include the inventors of the World Wide Web, TCP/IP networking, the UNIX operating system and the Java programming language. “IPython, the Jupyter Notebook and JupyterHub have become a de facto standard for data analysis in research, education, journalism and industry,” said the ACM award announcement in describing the significance of Project Jupyter. Dozens of Cal Poly students have assisted in developing Jupyter, which has changed the way work is done in industries ranging from genetics to finance. The software has become the go-to tool for authoring and sharing code for computational research, data science and AI. Jupyter was used by the scientific collaboration that won the 2017 Nobel Prize in Physics for the discovery of gravitational waves. The LIGO/VIRGO collaboration publishes Jupyter Notebooks that allow anyone to replicate their original analyses of the black holes and neutron stars that collide and generate these ripples in spacetime. More than 2 million Jupyter Notebooks are hosted on the popular GitHub service, covering technical documentation, course materials, books and academic publications. The Los Angeles Times, BuzzFeed News and the Chicago Tribune all use the Jupyter Notebook for data-driven reporting, and academic papers often include a Jupyter Notebook so that others can reproduce the scientific calculations. The 15-member Jupyter Steering Committee is the largest team ever to win ACM’s top honor. In addition to Granger and Pérez, the collaboration includes Cal Poly’s Carol Willing, Matthias Bussonnier of UC Berkeley, Paul Ivanov and Jason Grout of Bloomberg, Thomas Kluyver of the European XFEL, Damián Avila of Anaconda Inc., Steven Silvester of JP Morgan Chase, Cal Poly alumnus Jonathan Frederic of Google, Kyle Kelley of Netflix, Jessica Hamrick of DeepMind, Sylvain Corlay of QuantStack and Peter Parente of Valassis Digital. The team will receive the award and its $35,000 prize at the ACM Awards banquet in San Francisco on June 23. 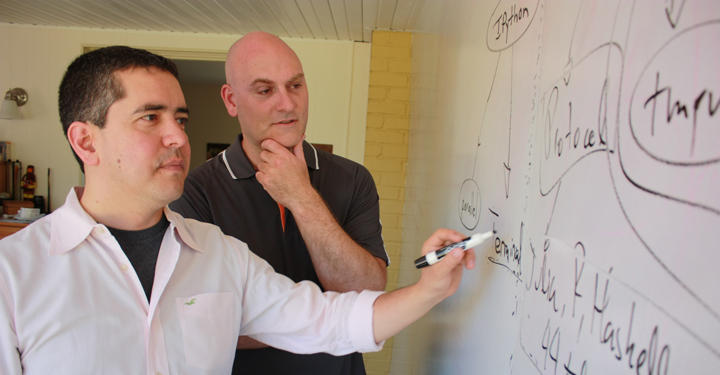 Cal Poly physics Professor Brian Granger (right) and Fernando Pérez of UC Berkeley discuss the architecture of Project Jupyter, an open-source software they helped develop that has changed the way work is done in industries ranging from genetics to finance.